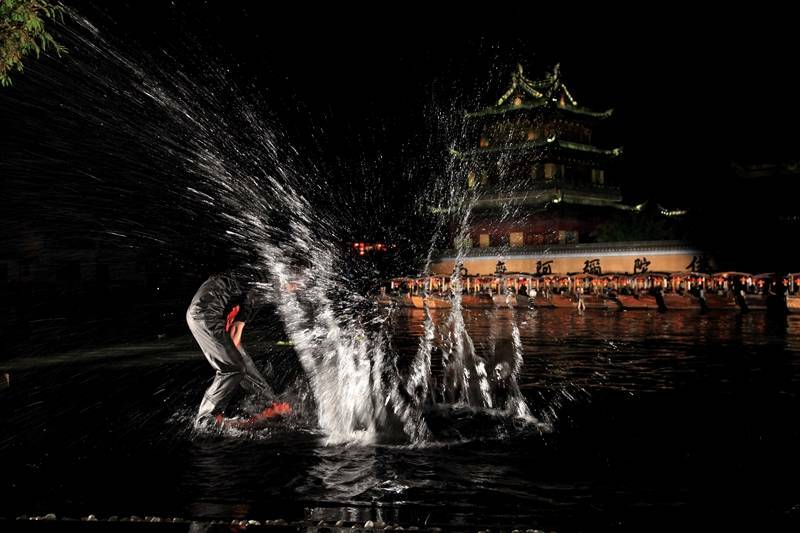 "One day I was walking along the river bank in Zhujiajiao when I stopped to listen to the monks' chants from the temple across the river... what a beautiful moment. In this very tranquility I had a vision, it was as if in this sacred chant I was listening to Bach's melodies. 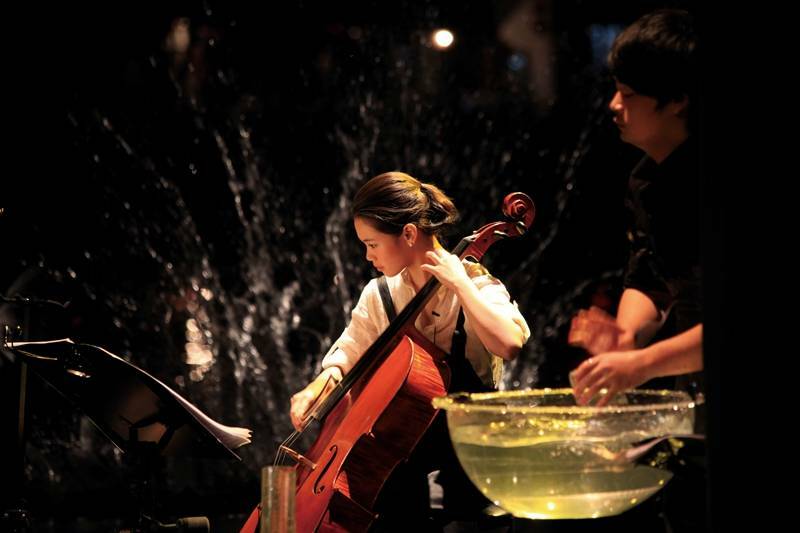 At the core of this vision was the harmony between people and nature, East and West, which would become the central theme running through the architecture and music concept of the Water Music Hall. I wanted to let the river flow in and out the music hall, to create a strong metaphor where in a space that transcends time the audience's hearts and minds would be washed clean and purified." 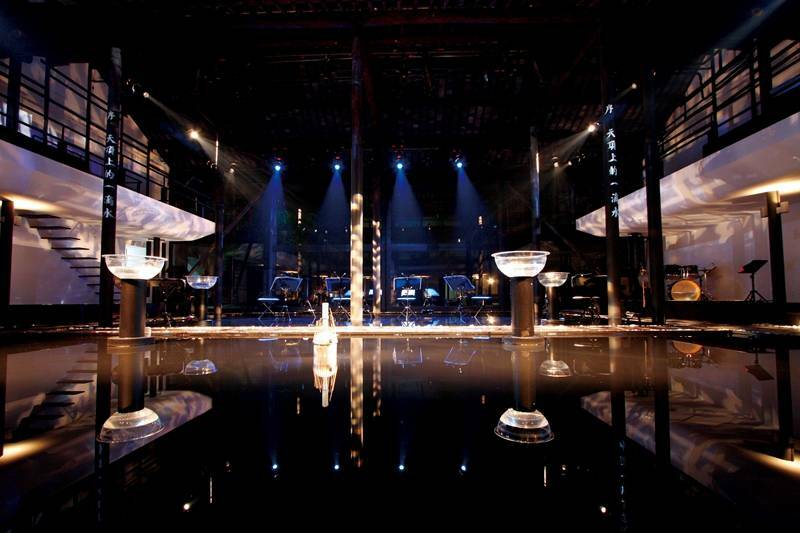 Every week, right on the outskirts of Shanghai, the peaceful and ancient water town Zhujiajiao lights up with one of China’s most creative and unique contemporary music performances. 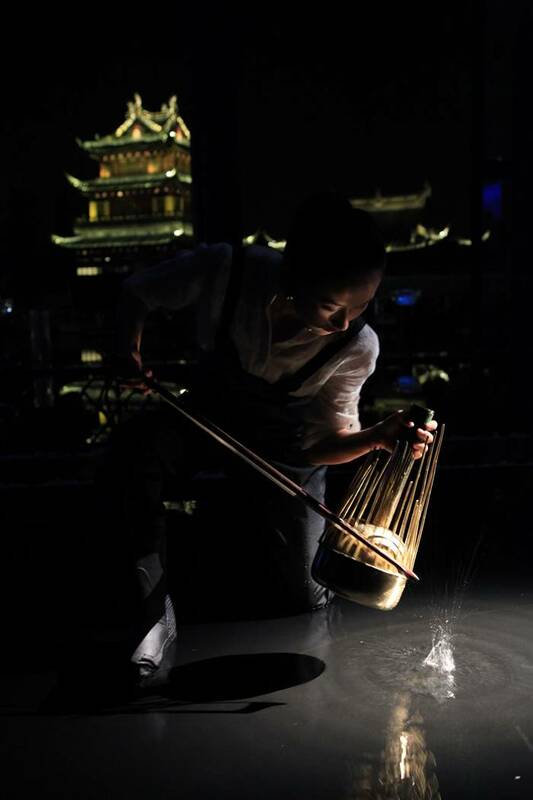 Conceived by Oscar and Grammy Award-winning composer Tan Dun for strings, water, pipa and voice, Water Heavens is a syncretic music performance where water takes center stage. 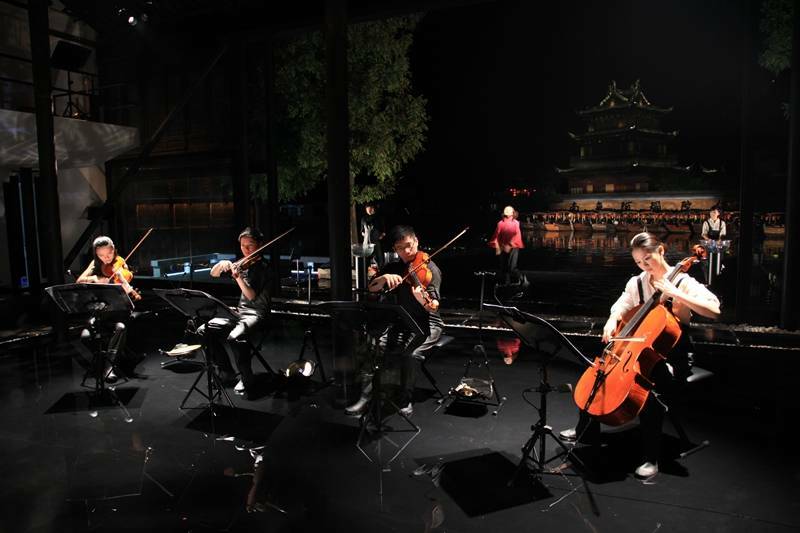 On a water-filled stage, Bach will dialogue with Buddhist monks, rock’n’roll will give way to strings and pipa duets, with water percussions reeling the audience with their virtuose, climaxing pace throughout. 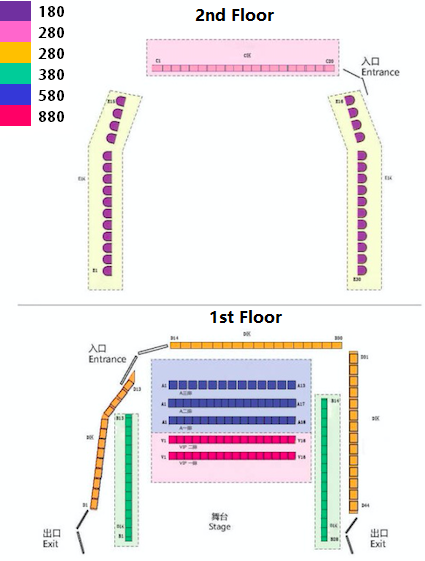 An eclectically unique architectural style mixes traditional Ming and minimalist Bauhaus characteristics in the performance hall. Designed by Tan Dun himself with Isozaki Studio Architects, the building acts as instrument too. ALL ATTENDEES NEED A TICKET. Children under 6 years old are not allowed to enter. Take the G50 highway and take the Zhujiajiao exit; follow Zhufeng road to Kezhiyuan road, then turn right to Kezhiyuan parking lot. Entrance to Zhujiajiao is right on Kezhiyuan parking lot. Walk straight on for 5 minutes. Water Heavens hall is at the end, on the right-hand side of the riverbank. Take the line 2/10 train to Hong Qiao Metro station and then transfer to line 17 train to Zhu Jia Jiao station, No.1 exit. Take the Huzhu Express from Pu'an Lu, crossing Yan'an Dong Lu station (metro People's Square, exit 1). Goes directly to Zhujiajiao bus station. As you get off the bus, walk back on Xiangyingbang rd, then turn right on Xin Feng Lu. Go straight until a big stone bridge “放生桥”. Cross the bridge, turn left. Go straight through alleys until you get to another river and a small bridge. Water Heavens is right across. Alternatively, look 水乐堂 in your maps application.